MoCo sends a strong group of athletes to the 2A state meet, but can any of these individuals come home with a state title? It will take a surprising breakthrough, but all of the athletes written about below have been credited with an unexpected performance at some point in time. Amy Ferro of Rockville returns to the state meet with the second fastest seed time in the 1600 after barely missing it last year. This will be Ferro's third trip to states while Nathan Austin will be a state meet rookie. In fact he asked me a few days ago where Morgan State is located. He dropped a 4:26.85 1600 at the county championship and then won the 2A West region title in the 3200 with a time of 9:58.05. 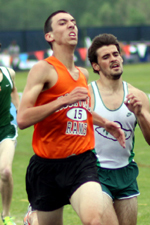 He will run the 1600 and 3200 at states although his competition, including Robby Creese and Luke Arbuckle, is tough. Chouassi Tshimanga of Rockville jumped 5-01 in the first meet of the season, but hasn't reached that height since. If she can hit around 5-00 or 5-02, she should be among the leaders. Poolesville has Sam Widmayer in the 800 and Eric Holmstead in the 1600. Widmayer went sub-2:00 here last year and hasn't dipped under 2 minutes in the open 800 since then. Holmstead is coming off a 1600-meter personal record of 4:31.14. 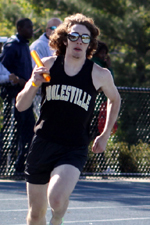 Poolesville also qualified relays in the 4x200, 4x400, and 4x800. They surprised everyone by winning the indoor 4x400 state title. It is a long shot, but they may be thinking about repeating that accomplishment outdoors. Wheaton's Aimee Hart has the third best seed in the girls 2A shot put, 34-02. Poolesville also has Kvin Dickerson in the 400. It wasn't on the heat sheet for some reason, but he qualified on time. I was told that our coach fixed this recently, so he should be officially in. Amy qualified for the 800 & 1600. Go Amy, Chousassi and Nate from your team!!!!! AMY! Great job - we all knew you could do it. What a way to end the season 3rd in the 1600. You are amazing! We �� you! We're going to miss having you on the team next year.